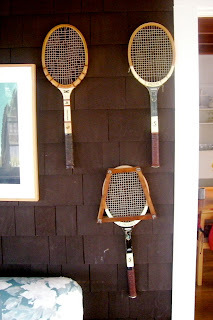 Reuse & Purpose: Tennis, Anyone? This excerpt from a post a while back always reminds me of the summer my sister and I took tennis lessons. It wasn't the fancy kind of classes taken at a "club," but as part of our Independence (Missouri) Parks & Recreation summer program that wasn't expensive at all and was lots of fun. I'm far from being even a fair tennis player, but I do enjoy watching the sport, and at one time, I actually knew all the rules! Often, the most ordinary objects can turn into magical focal points, especially when it comes to displaying a prized collection. In this out-take from The Find: The Housing Works Book of Decorating With Thrift Shop Treasures, Flea Market Objects, and Vintage Details, photographer Jim Franco captured the simple beauty of found seashells organized by shape and color within a set of inexpensive goldfish bowls. 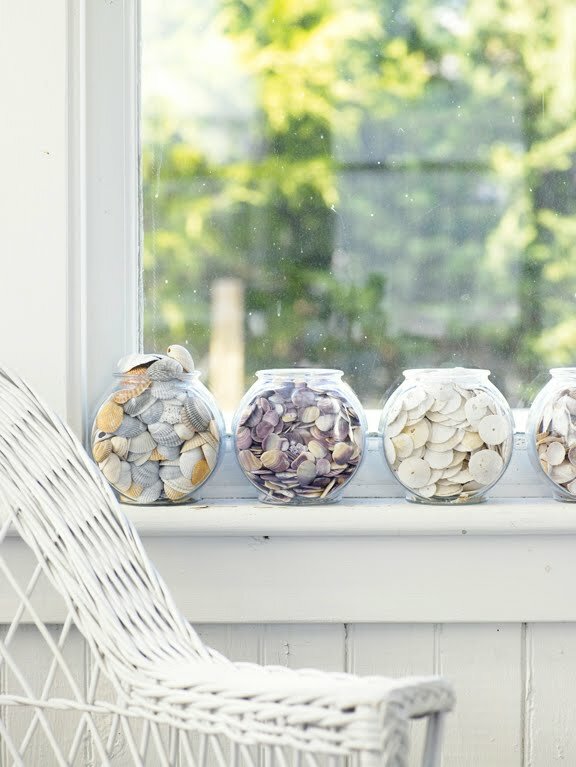 Light, airy and perfect for a sunny space. Found leaning against a wall in Union Square -- this beautiful book of Christmas stories. It's not that old, is in excellent condition, and when the holidays roll around will make a perfect Gift of Thrift! A while back I was invited to a summer barbecue and I decided to make a banana pudding. Since I like to always like to bring my homemade creations in a dish I can leave behind, it took me no longer than five minutes at Goodwill to spot this 1970s ceramics watermelon container, perfect for serving up a cheerful pudding. I put together a little video of my assembling this pudding in my own kitchen. And while the end result was somewhat soupy yet delicious, I did learn that making meringue on a hot, humid day was not a great idea! 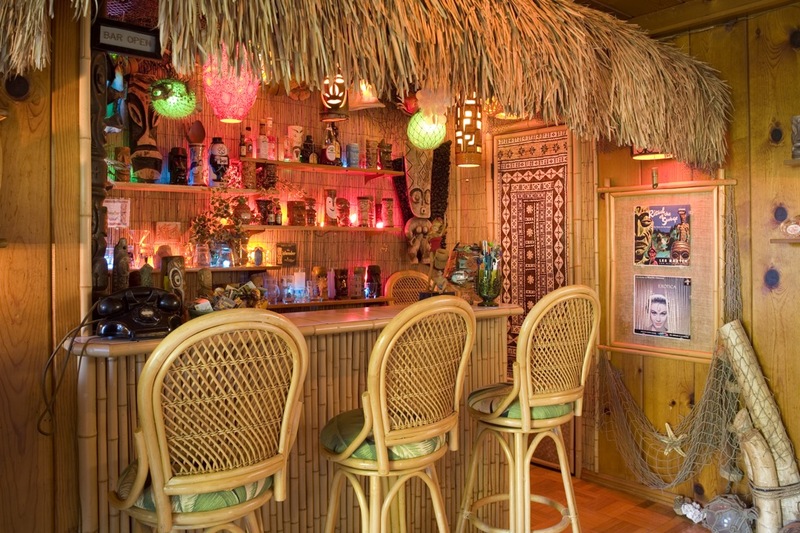 When you walk into the midcentury home of Peter Moruzzi and Lauren LeBaron, you'd have no idea that in the basement of their Silver Lake abode is a tiki bar, complete with funny-faced mugs and topped with a thatched roof. Photographed by Bob Greenspan for The Find: The Housing Works Book of Decorating With Thrift Shop Treasures, Flea Market Objects, and Vintage Details, this location was discovered on the fly driving down the 405 when a magazine colleague who knew I was looking for locations gave me Peter's phone number and told me to call him about his tiki bar. I rang Peter, he answered, and told him I was working on a book about decorating with vintage and thrift and asked if I could come to see it. "When?" he asked. "Tomorrow morning?" I queried. "And one more thing," I added. "I have a photographer with me in case we want to shoot it. Is that OK?" He agreed, and we showed up at his door the following day at 9 a.m.. 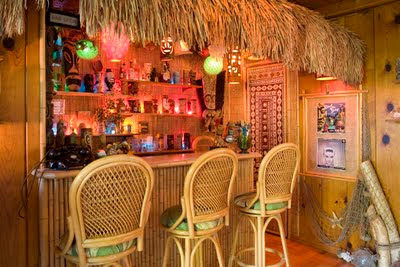 He led us through his home filled with midcentury treasures and pieces of modern art and then down to what he called the rumpus room, and there it was: the tiki bar we had heard so much about. It only took us seconds before we decided to photograph our discovery, and in fewer than 24 hours had added yet another magical location to the pages of The Find. As many of you know, if I could dash off for a leisurely getaway to anywhere in the world at a moment's notice, it would be Paris, a locale that never loses its intrigue for me. Having attended university in France several years ago, I used to go to Paris at least once a year to visit friends or to traipse around town seeing film and viewing art exhibits. Or just wandering -- truly with no destination in mind. That's why when I ran across this expanded map of Paris for 50 cents at a loft sale in SoHo, I picked it up. It's not particularly old; the Centre Pompidou that was built in the 1970s is marked. But it pre-dates the Euro, since someone handed over 145 French francs to purchase it. Inside was a ticket for the bus, and on a blank page some restaurant addresses. And for the few pennies that I rendered for this little book, I'll be able to use it for my next trip -- or at least for an afternoon of daydreaming. When it comes to putting together personalized birthday gifts, I like to rely on the thrift gods to lead the way. My search method pretty much involves letting presents appear on their own whenever I'm out and about digging through boxes of old dishes, sifting through stacks of ephemera or fishing through bags of ladies finery. These wooden eyeglass holder caught my eye at a Jersey Shore garage sale because they reminded me of my thrifting pal Ruth Handel's fancy frames -- and it was $1. From there, the offering just came together -- a vintage birthday wish in a box of Hallmark greeting cards ($1.50 for all) from a garage sale in Independence, Missouri; a bit of ribbon picked up at a yard sale (5 cents) and gift wrap that Ruth once used to wrap a gift for me (free!). Reuse & Purpose: Vive La France! It was exactly two years ago when The Vintage Laundress LeAnn Stephenson fěted The Find. Here's a little gift I made for her when I was on the road. 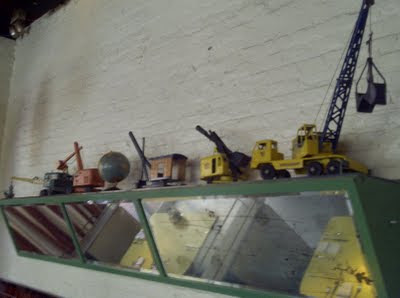 When I was a kid, I had a metal Tonka Toy crane very similar to the the yellow one in this collection of playthings decorating the walls of New York's B-Bar. Mine was a finicky object whose mechanism was easily tangled, thus putting the whole thing out of commission. No matter how careful I was, the picker-upper part of this piece never seemed to be able to lift anything bigger than a Matchbox car and easily dropped open, spill its contents all over the floor. Dad would re-adjust its riggings, and then I'd start picking things up all over again...that is until it got all tangled up again. And of course, Dad came once again to the rescue! The Find: More to Go-Go-Go! 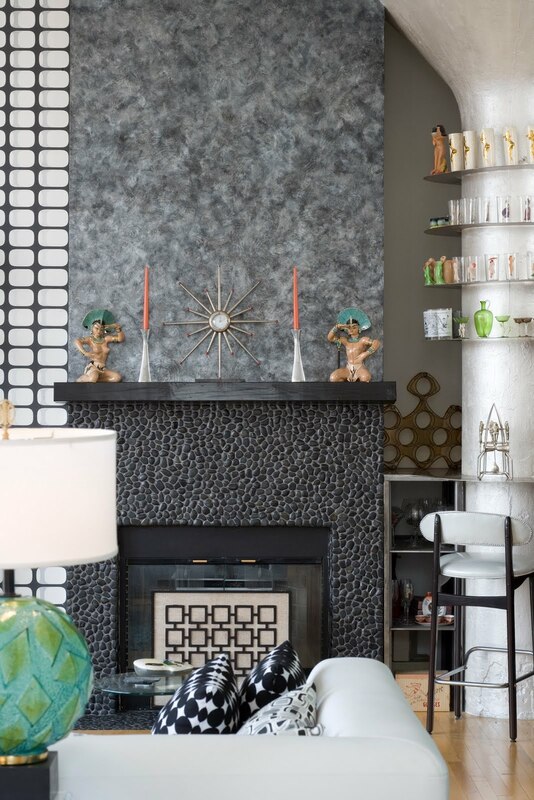 Last week I shared an images of Go-Go Jane Wiedlin's LA living room that is featured in my book The Find: The Housing Works Book of Decorating With Thrift Shop Treasures, Flea Market Objects, and Vintage Details. 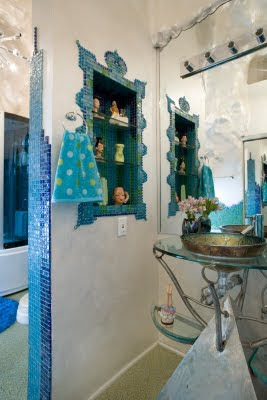 Here's an out-take by Bob Greenspan of her fabulous, out-of-this-world bathroom in the apartment that Jane tells me is now up for rent!! So if you ever have wanted to live in a rock star's pad, here's your chance. 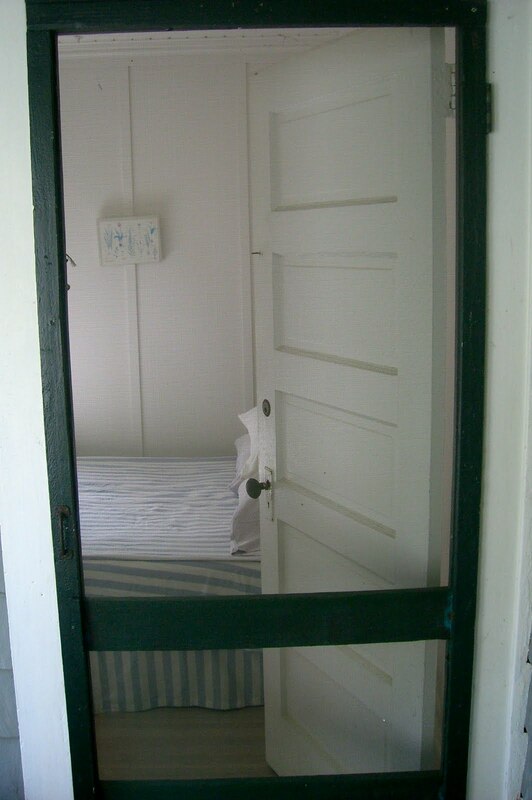 One of the most comforting summertime sounds is the gentle slap of a wooden screen door. Now for some, it might be annoying racket, but for me, it always brings back memories of summer at Grandma's house, where we'd all gather on the front porch for chilled watermelon or homemade ice cream or lazily lounge as the evening cooled to the tune of cooing whippoorwills and chirping frogs. 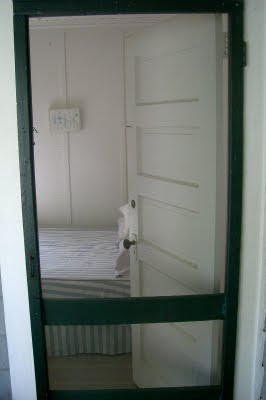 During the day, the door might swing open with an aunt toting a bucket heaped with wild strawberries picked by the side of the road or an uncle with line full of fish caught in the pond just across the highway. And as soon as someone came through this mesh and wooden barrier, it would snap shut with its familiar clap. Oh the sounds of summer! Spotted in the vitrine of New York City's Flatiron Building: An art installation by Miles Neidinger made entirely of twist ties, straws, vinyl tape, yarn cellophane paper and hair tinsel. Why do I love garage sales so much? Could it be that you can buy three boxes of unused, vintage greeting cards from the 1960s and 1970s for less than $4? The Find: On the Go-Go! 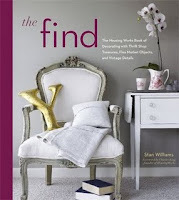 Since just a few weeks ago I saw The Go-Go's once again in concert, I thought I'd share with you one of my favorite locations from The Find: The Housing Works Book of Decorating With Thrift Shop Treasures, Flea Market Objects, and Vintage Details. Here's one of the images shot by Bob Greenspan of Go-Go Jane Wiedlin's downtown LA loft that exudes her quirky personality. Spiced up with imagery from girlie pin-ups and space-aged objects, the space shows off Jane's lust for originality and humor. I also like the way Jane incorporated what could have been eyesores. For instance, she turned the columns that run through her apartment into pleasing focal points. The column on the right was painted an intergalactic silver, and then ringed with metal shelves to show off her collection of pin-up cocktail glasses and retro barware. And the fireplace made of river stone, crafted by the creative folks at Skellramics, is accentuated by an old speaker cover that Jane just happened to have lying around. Summertime meant loading up the car and driving across the country to whatever destination we had taken months to plan. Once we left Independence, Missouri, for Orlando, Florida, to visit Disney World and Gatorland Zoo. It was the first time I'd ever set foot in the ocean or actually seen oranges growing on a tree. Another time we headed off to Nashville, Tennessee where we spent two days at the long-gone Opryland USA amusement park and caught an evening performance of The Grand Ole Opry. I even had my picture made with Dolly Parton's star on the Country Music Walk of Fame, which was taken away when the museum was relocated a few years back. Then on one particular vacation, we piled into our 1973 Chevrolet Impala and headed out to Estes Park, Colorado. 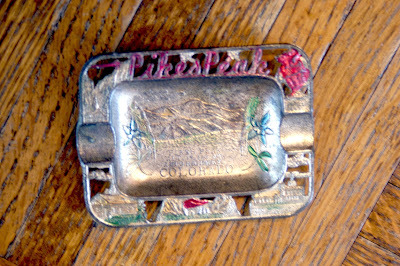 That's the trip where I picked up this Pike's Peak ash tray. While nobody in my family smoked, I was allowed to buy this souvenir that today reminds me of how we only went up the mountain half-way because our brakes almost went out and how my sister and I were amazed that we could write our names in snow in the middle of summer. My parents did an ingenious job of putting together activities for us to enjoy, even without the help of the Internet. We saw the Royal Lippizzaner horses perform on night, and then another evening we rode out to a dude ranch for a barbecue. We even waded in the icy Big Thompson river just months before it flooded. Being teachers, my parents economized on our trips, meaning that Mom traveled with an electric skillet to heat up at least one meal a day. But for a few days far away from home, we still felt super-fancy staying in that Ramada Inn with a swimming pool -- and enjoying a time together that would forever last in memories.